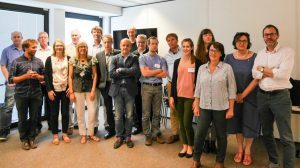 Workshop on European strategy for the Atlantic ocean observing systems within the AtlantOS (EC H2020 project) legacy activities. Brussels, 4-5 June 2018. Monaco Ocean Week, 9 April, Conference on Beauty, sea and Ethics	IAPG France, co-chaired by Michèle Barbier & David Crookall. IAPG France, co-chaired by Michèle Barbier & David Crookall.